You make valid points, especially about the chewing gum. Justice Scalia drew a similar parallel with cosmetics. The real money is not spent on advertising as much as lobbying which influences the elected representatives responsible for crafting policies and legislation. Occasionally some ad or other will have an impace, but most everyday voters are indifferent to policy matters that do not concern them directly. Campaigns are mostly competing games of bait-and-switch and bending the narrative. 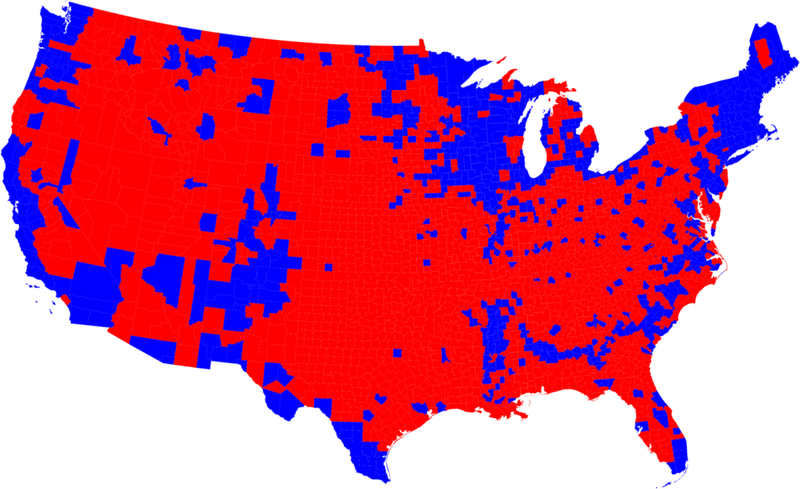 - I love these cartogram maps, if only because otherwise the nation (especially if you go to the county level) looks basically all red. - That said, I didn't really see that "morphing by money" was doing anything in that video - if you weighted by predicted/historical margin of victory, or difference in party identification, you'd get the same map. The purpleness of the state attracts the money because that's where spending matters. This is bad, but the root cause of the distortion is the EC, not money. - The way to see the impact of money - in those states or anywhere else - would be to do some regression to relate difference in spending to outcomes, taking into account all the other usual suspects. Even such a relation if found would be tricky, since one reason a candidate might have trouble raising money is an enthusiasm gap, which reverses the arrow. - Scalia ends that interview on a really weak note when he suggests that voters know who's speaking even when they don't know who's funding the speech. Last night's election results prove Prasad's point. Here is a New Yorker cartoon. Re. shadow money and real under the table stuff - I have a weak hunch it's much larger than the declared spending. It seems incredible that with the most powerful job in the world on the line, total spending would be only in the few billion dollar regime. I'd think Lockheed Martin alone would spend in the hundreds of millions - they'd be crazy not to. Maybe they think it's more cost effective to buy politicians after election. That sort of spending and bribing is basically unregulated and unregulatable, since illegal to begin with. Incidentally, after the results, I'm wondering if "highly number-aware election geek with lots of local knowledge" is going to become a booming and even better paid job description. The real superstars like Axelrod or Rove in '04 might be both too famous and too ideologically committed to be for inter-party sale, but at even one rung lower you might have action. You could see small armies of mathy, data rich election pros for sale to the highest bidder. If you get the best experts on a county, you win the election there, so it's a new competition. Say there are ~250 counties that "matter" so every campaign needs five people in each of them permanently on hire. It could be the new zero sum brain-drain for smart college grads, after high-frequency trading. I think unlike third world countries where bribe taking occurs in office and openly, in more "regulated" nations like the US, it occurs after the tenure in office - as lobbyists, in the form of foundations and speaking engagments. I recall as an undergrad at Georgia State hearing that we had a highly respected school of Business. And the elite of the business school were studying actuarial science, the numbers geeks working for insurance and financial firms who get the big bucks. It's not a stretch to think of today's election strategy geeks as an elite cohort.It seems Nate Silver comes out of this election as a rock star for polling. And the Obama team turns out to be for politics what Michael Phelps is to swimming. This commentary describes how the Obama team won using the Rove formula. He DIDN'T BUILD THAT vehicle but he sure learned how to drive it. Ruchira, I'm too cynical perhaps, but I suspect it's more than just speaking fees and foundations. I think Goldman Sachs/JP Morgan, or Microsoft in the antitrust days, or Shell or whoever wants that new pipeline, or RIAA and company, these people are probably making actual honest-to-goodness Cayman Islands transfers to persuadable congressmen, senators, high ranking officials, secretaries and the like. Then again, while Larry Summers is rich, he's probably ten million rich, not half a billion rich. I guess if you have the mindshare and are on the speed-dial, you don't even need the bank account number. John, Nate Silver is a genuine positive side to the attack of the quants in elections. May it continue, and reduce the noise of uninformed or wishful commentary. A dozen or so actual academic statisticians should take up the task too...some guy with a secret spreadsheet isn't enough! In fact, why aren't Gallup or Pew averaging polls themselves?